But will Yellen’s gambit plunge us into a recession is the question. Just because Wall Street is gorging on high returns doesn’t mean the economy is sound. For eight years and running, the Fed has kept interest rates near zero percent in an attempt to spark investment and borrowing. Unemployment has gradually shrunk during the Obama years, yet the workforce participation rateremains low by modern standards. Prior to Election Day, two-thirds of Americans were anxious about their economic future. 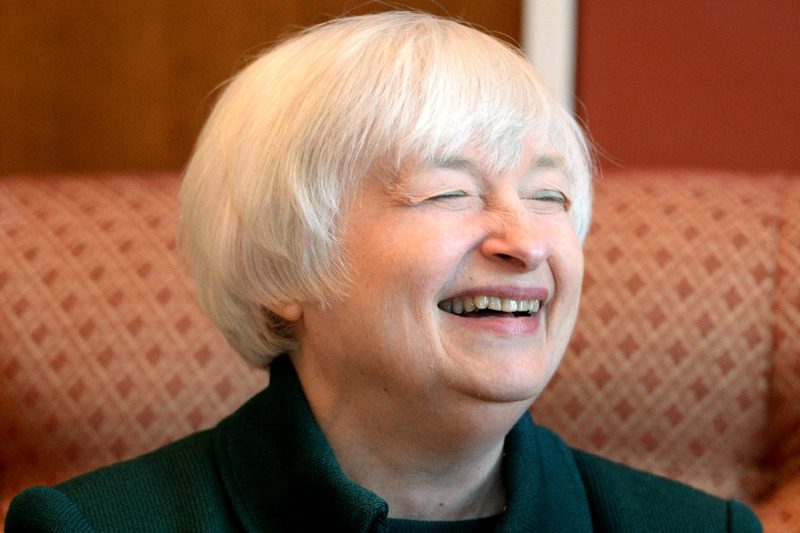 So you might think: Hey, maybe Yellen’s hinting about raising interest rates is a good thing! Sure, it might cause the S&P 500 to dip. But it’s about time Grandma got a return on her CDs. Uh huh. And I’m the Archbishop of Canterbury. Since the beginning, the Federal Reserve was designed to operate in secret, away from the prying eye of politics. A nation’s money supply is a fragile thing: If you have too much, you get hyperinflation that destroys the currency. If you have too little, deflation sets in, and people withhold from spending. (The last part of the logic is phooey, but that’s a topic for another article). What the Fed, serving as America’s central bank, does is balance the money supply to reflect market conditions. When the market is roaring, it’s time to cut off the money spigot so as to rein in inflation. When things are sluggish, pouring cash into the economy is supposed to gin up activity. There are all kinds of ins and outs and what-have-yous involved in the process, including convoluted accounting techniques. But long mythologized story short, the tinkers at the Fed are supposed to act on behalf of the economy, and not the elected shysters in Washington. Every macro-econ student learns that faux civics lesson the first week of class. And like almost everything taught at college these days, Fed independence is a load of garbage. From its inception, the central bank has been a political tool presidents have used to bolster their administration’s approval ratings. “[T]he Federal Reserve fundamentally shifted its monetary policy course in 1953, 1961, 1969, 1974, and 1977 — all years in which the presidency changed. Fed policy almost always changes to accommodate varying presidential preferences,” writes economist Thomas DiLorenzo. When presidents want tighter money—like Ike and Reagan did during their respective terms—the Fed obliges. When presidents demand loose monetary policy—such as LBJ and Nixon—the money magicians at the Fed make it so. Ultimately, the Federal Reserve is a creature of Congress, and much of its leadership is staffed by presidential appointment. Should the president be unpleased by the Fed’s performance, there are consequences. G. William Miller’s short and disastrous 18-month-term under Jimmy Carter demonstrated as much. So where does that leave Yellen? Trump threatened to oust the troll-looking monetary maiden on the campaign trail. It’s not within the president’s power to announce “You’re fired!” to a sitting Fed chairman. Pushing her out will take some cajoling. Somehow, though, I don’t think Mrs. Yellen wants to take orders from a President Trump. And what would be a better going-away present for a new but critical administration than crippling the economy? If it is indeed Yellen’s plan to tank the Trump presidency on her way out by raising interest rates, the Donald should fight back. He should take to his best medium, the TV, and begin making the public aware of the sabotage going on. When Yellen abandons her throne, Trump should appoint someone who is concerned about the dollar’s long-term stability. A few choices off the top of my head: finance writer and all-around mensch Jim Grant, former Director of the Office of Management and Budget David Stockman, commodity guru Jim Rogers, or former congressional representative and arch-Fed-critic Ron Paul. Either would do nicely in turning the Fed from a politically-driven economy-destroying machine into something far less dangerous. And each could do their part in making King Dollar great again.